Free app connects residents with recycling information in handy mobile format. Recycle Coach provides accurate, up-to-date information on Union County’s recycling events as well as local recycling schedules in a handy, user-friendly mobile format. The app provides personalized collection schedules based on place of residence. 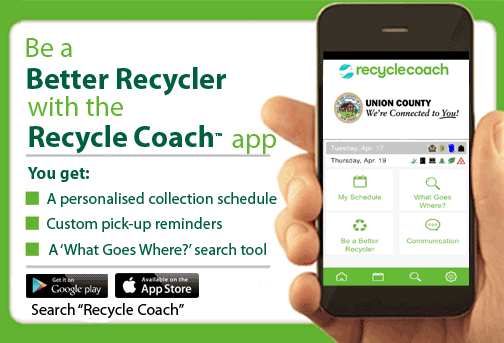 Once a resident downloads Recycle Coach, their calendar will list Union County recycling events along with local curbside garbage and recycling schedules. The app will advise if there are changes in local collection due to holidays or weather. Recycle Coach users can also set up recycling reminders and improve their recycling rates through a “What Goes Where?” search tool. The New Jersey Department of Environmental Protection is the first state to purchase the Recycle Coach app and make it available to all New Jersey residents free of charge. “By improving recycling rates here in Union County, we will also be contributing to our state’s ongoing commitment as a national leader in recycling,” said Chairman Granados.